Pour over coffee: it doesn’t just taste good, it actually teaches us a lot about design! In tech or design talk we call this a ‘step change’ in the coffee experience J . It’s not just optimization or marginal improvement. It’s a leap forward. Moreover – as in any design process – step improvement often comes from thinking about the problem in a different way altogether and simplifying the solution. Think of this: companies like illy, Nestle, Lavazza and so many others are investing more and more in sophisticated technology to create the perfect water pressure to extract the right amount of flavor from a coffee, pour over coffee does better using gravity, and just the right cone shape with which the right amount of coffee (26 grams to be precise) ground to the right grain size. That creates just enough friction for the water to trickle down at exactly the right pace. A little too fast and the coffee is watery and tasteless. A little too slow and its too dense and bitter. So there you have it – a better result done manually. Simplicity always beats sophistication when executed right. You are more in control of your coffee taste, you enjoy the process more, it tastes a lot better and cost a fraction of the cost of any coffee a machine. 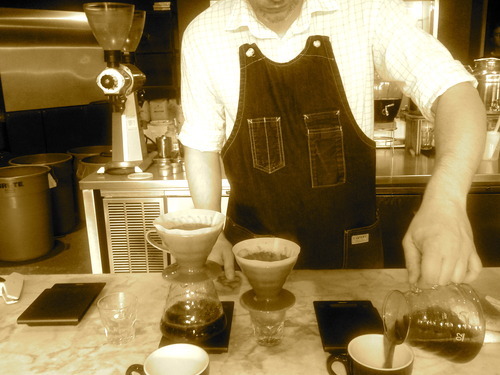 Like many great products pour over coffee has created a new kind of social experience. New coffee bars are cropping up in Brooklyn and Manhattan which make a great pour. Watching the coffee being poured slowly and in steps is a big part of the experience It’s akin to watching sushi masters behind the counter in a great sushi bar. It engages with the customer in ways that just getting it out of a machine doesn’t while taking in the odor which is much stronger and sweeter than the burnt taste of espresso. It’s pure enjoyment. Toby’s Estate is one of my favourite places in Brooklyn which makes a mean pour.